NakedPRGirl: Where are you from originally and where do you live now? David Meerman Scott: I grew up in Connecticut on the USA East coast and then I went to school in Ohio at Kenyon college. My first job was in New York City on a bond trading desk of all places – which I hated. Then I went behind the screens because I loved the technology, the data and the news that was going through the systems like Dow Jones and Reuters and Bloomberg so I wanted to work in the financial news and information business. I started doing that, moved to Tokyo when I was 26 years old to start the Asia office of a Wall Street economic consulting company. I did that for a couple of years and then joined Knight-Ridder which at the time was the second largest newspaper company in the United States and I was their Asia Marketing Director, specifically focused on real time news. And that was great to give me an opportunity to see how real time news worked because I have been using those ideas for a very long time since then. And then I ended up being in Asia almost 10 years – Tokyo was about 7 years, Hong Kong was 2 years and I moved to Boston about 20 years ago – I’ve been in Boston ever since – I really like the idea of Boston. It’s been a great spot to live, it’s got a great airport because I travel a lot, I’ve got a vacation house on the beach area here outside of Boston and I really like it. I studied economics, that had absolutely nothing to do with what I’m doing now which is kind of neat. I didn’t do very well in school because it was kind of boring for me but I did enjoy learning the things that I liked. I made it into Harvard via the back door. Was rejected by Harvard Business School but the Harvard Coop bookstore carries my books. NakedPRGirl: What was your big break? David Meerman Scott: Well based on the fact of what I’m doing now the biggest break for me was the fact that I got sacked from Thomson Reuters in 2002. It was great because the fact that I got fired meant that I had to figure out what I was going to do next and that allowed me an opportunity to start my own business back in 2002. Initially for the first few years I did consulting around public relations and marketing – I did that for around five years and then in 2007 the first edition of the New Rules of Marketing and PR came out. As that book launched, it hit the International bestseller lists and that drove speaking engagements. Then I stopped doing consulting which I have not done since. So my biggest break was getting fired – how about that right? NakedPRGirl: Tell me about your business, what is the idea behind it? How did you come up with the business plan? And name (I hear there’s a good story behind the Meerman)? Paid speaking engagements – I do 30 or 40 a year around the world which I absolutely love. I generate book royalties and my books sell pretty well so it’s actually a reasonably strong part of my revenue stream. I serve on advisory boards of companies – like HubSpot for example, where I’ve been an advisor since 2007. Rather than take cash for that work I take equity which has been great for me because three of the companies I work for have an exit which generates revenue for me. Meerman is my middle name – there are a whole bunch of David Scott’s out there – one who was an Iron Man triathlon champion, a David Scott who is a member of Congress, a David Scott who walked on the surface of the moon and so rather than compete I use my middle name Meerman in my professional endeavours. This has been a really important aspect of my branding in that I am one of one rather than one of many. NakedPRGirl: How did you come to write your first book? Is it something you always wanted to do? What tips do you have for people looking to get published? David Meerman Scott: My first book was actually a novel called Eyeball Wars, the first novel about an Internet start-up company. I just had that book in me, I had to get it out, I was eager to get that book out. The second book I wrote was my first non-fiction book, it’s called ‘Cashing in with Content’. It was ahead of its time – it was the first book in the world on content marketing and if I had called it ‘Content Marketing’ it would have been a very different book. However, I called it ‘Cashing in with Content’ which was a truly horrendous name and therefore it didn’t get much notice – but it definitely was the first book about content marketing. The third book I wrote – The New Rules of Marketing an PR was the one that hit perfectly in terms of timing, just when people were looking for what’s going on the web in PR and Marketing and now is in its 6th edition. I’ve written 10 books altogether: some other one’s that I’m known for is ‘Marketing Lesson from the Grateful Dead”, ‘The New Rules of Sales and Service’, ‘Real Time Marketing and PR’ and a book called ‘Marketing the Moon’ which is the Marketing aspects of the Apollo Moon program that’s being turned into a movie that will be released in the July of 2019. Take a look at all of David's books here. NakedPRGirl: The industry is moving so fast that you’re now on the 6th edition of your international best-selling book The New Rules of Marketing & PR. How have you seen your industry changing over the last few years? David Meerman Scott: Interestingly, the strategy around marketing and PR that I talk about which is that you need to create content to get noticed as opposed to just trying to spend money on advertising or begging people who are members of the media to get noticed – that strategy has not changed. So over all of the 6th editions from 2007 until the most recent edition the strategies are the same. What’s changed are the techniques and the tools. Twitter didn’t even exist when I was writing the first edition of the book, Facebook was only for students when I was writing the first edition of the book. MySpace was the most important social network when I was writing the first edition of my book so lots and lots of things have changed over the years so for example when Instagram came around that need to get added to the book, when Google started to index blogs in real time that needed to get added to the book, when Google eliminated Google Plus that needed to get deleted from the book, because they have shut it down. The main thing that changes as well is that I always have new examples of success in the new editions of the book which is why it’s important to do that. I never in a bazillion years thought I would perform in a Las Vegas theater seating thousands for 90 minuets. Thanks @tonyrobbins for making that happen. Context- In a few days one of my favorite artists Jack White plays this room! NakedPRGirl: In the UK we’ve seen many much-loved magazines and online news channels going into administration and closing down so as you know PR is evolving. Where do you see it evolving in the future? David Meerman Scott: Yes, magazines and newspapers are closing down, the media is changing. When everyone can be a media company what does that mean for professional media companies? That’s the big question. At one-time media was scarce, at one time you needed a printing press, you need a television studio, you needed to have a huge infrastructure to create media and that meant that the media business enjoyed a period of time where they could print money if they did a decent job. Newspapers in cities did extremely well because they could sell advertising, because that was one of the few places you could advertise. Now it’s changing completely and what we need to realise as PR executives is that the media is way more than traditional media, the idea of getting noticed is way more than traditional media. it’s everyone – it’s all of us. And rather than just focusing on how you can get some else to tell your story the main thing I see happening, which has been evolving for 15 years is that you can tell your story yourself. That’s really important to understand as PR people. We don’t just have to have the media write about us and what’s interesting there in my opinion is that if you do a great job in telling them the story yourself; through a video, through a blog post, through speaking from the stage, through a fabulous Twitter or Instagram feed or whatever the media may find you. I love the idea the you can create this stuff yourself. NakedPRGirl: One of my favourite parts of your book, is the cocktail party analogy where you explain that social IS social and shouldn’t just be one-way sales traffic. In a world of algorithms and advertising, do you think being friendly is the best way to excel on social media? David Meerman Scott: So I love this analogy which I put in ‘The New Rules of Marketing and PR’ that social media and online communications is like a fat, honking cocktail party. So you’ve got all different aspects of that cocktail party going on and so how do you interact with people at a cocktail party? Well the way that you interact is that you go in and you meet a few people, you have some great conversations, you share, you let other people talk, you might share a little bit about what you do for a living but that’s not the dominant thing you do when you go to a cocktail party. And that’s so different from how most people participate in social media because what most people do is that they focus way too much on the idea of trying to pitch their own products and services. That’s like going into a cocktail party and yelling at the top of your lungs “buy my product’ and nobody wants to hear somebody at a cocktail party trying to pimp their own products – it just doesn’t work that way. So it’s much better to focus on just acting like a normal human being. NakedPRGirl: I noticed in your blog post that you are a fan of mixing business and personal life on social media - do you think that is one of the hardest points to grasp as a brand? I always say for journalists and PRs especially, we have spent a lifetime being behind the camera and behind the scenes, and suddenly we have to embrace self promotion. Do you have any tips on how we get comfortable with this? David Meerman Scott: And yes you did notice that I love the idea of mixing business and pleasure in your personal life on social networks and with content because I think people really want to do business with other people. They don’t want to do business with a big nameless, faceless organisation – they want to do business with other people. So the more that you put yourself out there the more that you can have people gravitate to what you do – I’m very convinced of that. And I think that it’s important for people who work in organisations to understand that the more you can get people who work in our organisation to come out from behind the curtain and be human beings, the better it is for that brand to personalise themselves. NakedPRGirl: I noticed your recent website redesign (which looks great) resulted in a 359 percent increase in traffic by working with web strategists IMPACT. How important is it for us to work with experts when making big changes? David Meerman Scott: I did redesign the website both from the visual aspect but also what’s going on in the back end of the website and it has had an amazing impact on my search engine traffic. People who have commented on my new redesign so they love it. It was really important – one of the things I did was I moved my blog onto Davidmeerman.com and that’s helped a lot because I was actually competing with myself, I used to have a different blog URL and I was competing with myself for search engine traffic which I silly but that’s what I did and I’m glad I changed it. I worked with the people from Impact Branding and Design and I was really important for me to work with someone who was an expert both in the visual branding aspect as well as the back end technology aspect and that was an important aspect for me. NakedPRGirl: How do you manage your blog and social media workload - do you have a team? Are you a planner and a scheduler? And do you get techy in the back end? David Meerman Scott: I just do it because I enjoy it and my focus is that I tend to do one blog post a week and a video now and then and I’m on Twitter every day several times a day – I check the news every day because I’m always looking for something for newsjacking. And I’m always thinking of images that would be interesting to post to Instagram. So for me it doesn’t feel like work or workload, it doesn’t feel like a chore because I constantly have it in the back of my mind and I tend to do Twitter during downtime: waiting for a meeting to start, waiting for the show to start if I’m in the audience and we’ve got 10 minutes until the curtain comes down. Instagram is basically, when I see an image I push it out there – I don’t think “oh I must do an Instagram now”. NakedPRGirl: Instagram has completely changed our industry and it is hugely influential in terms of driving sales. So many businesses are focusing on social media, what advice would you give them to utilise this platform? David Meerman Scott: I think just be yourself, don’t try to focus on your own products and services. I think a lot of organisations are spending too much time on that whereas I think what’s more interesting is focusing on stories and images themselves. NakedPRGirl: Let's talk influencers; social media is particularly criticised for transparency on ads and has also been open to manipulation from those seeing to fake their likes, followers and engagement. Do you think we are doing enough to regulate the industry? David Meerman Scott: If you look at the movie about the Fyre Festival as an example – this was a Festival gone horribly wrong and which was originally promoted by social media influencers. It’s really important that influencer recognise that as influencers they have a tremendous responsibility. I don’t know if I would consider myself one but many people consider me an influencer in different aspects – whether that has to do with music, marketing, PR or travel. So I’m very careful if there is something I am talking about that I am in some way related to. For example, I am on the HubSpot advisory board and HubSpot is also the blogging platform that I use but if I ever talk about the fact that I am a HubSpot customer I will always say that I am on the HubSpot advisory board. That is so it doesn’t feel like I’m trying to promote them without talking about the fact that I also have a business relationship with them. So it is very important that there is transparency around the idea of influencers. NakedPRGirl: Tell me about ‘newsjacking’ in PR & Marketing. Is there a standout example you use to demonstrate? Or anything recent which would have been a great story to jump on? David Meerman Scott: Interestingly the term “newsjacking” was originally was used in the 1970s in the UK to talk about people who stole a package of newspapers in front of a news stand that they eventually sold. What I did was I applied that term to the idea of following what’s going on in the news and then creating something (a blog posts, a YouTube video, a tweet with a hashtag, a live stream) where you inject your take on that news. So it’s essentially real-time PR, but the most important thing is that it has to be instant and right when there is a breaking news story. An example in my world is that I focused for several years on the US Presidential Election cycle of 2016 which is the one where Donald Trump was elected President. I followed the candidate for two years before that election and very early on I prediction Donald Trump was going to win because he was the most real time candidate. Then when he did win, I had an area of expertise that the media was looking for because everyone was confused as to why Donald Trump won. I did a blog post saying the best marketer was elected president and that got me quoted in a whole bunch of publications, it got me speaking gigs because my area of expertise was suddenly in demand. So what you need to do as a newsjacker is just understand that, no matter who is reading this right now everyone one of us has an area of expertise that we can push content out in real time. NakedPRGirl: I’m a hybrid of an old school PR dealing with press releases and print media, and part new world PR where I’m focusing on social media, content creation and influencer relations. Do you think these will co-exist / merge together or will the digital side eclipse our need for old school media methods. David Meerman Scott: I believe that Media Relations is a subset of Public Relations. The problem is almost everybody thinks that they are the same thing. PR is simply how a person or organisation deals with its public and that can take many different forms. You give a speech that people will hear, you communicate with people directly – perhaps at your store, you are active on social networks putting your content out there, you write a book to showcase your expertise. All of these are parts of the wider set of Public Relations. The narrower set of Media Relations is how you work with members of the media – reporters and editors, and bloggers and influencers – so that they may want to write a broadcast about you and I think those are two different things. 20 years ago it was the same thing because we didn’t have any other way of getting our information out there except form going through the media. Now there are a lot of different opportunities instead of going through the media so those are two different things. NakedPRGirl: What advice would you give to those looking to get into the PR & Marketing industry? David Meerman Scott: Really important – I would suggest that you have to create content that shows who you are; write a blog, do a YouTube channel, so you’re not saying “here’s my CV I want to get into the industry”, rather you’re saying “here is the blog I made, here is the YouTube channel I made – I am a PR person already” even if you’re just a student that is something anyone can do. NakedPRGirl: You’ve travelled the world speaking at conferences and worked with famous faces around the globe. Do you have a particular career highlight that stands out? 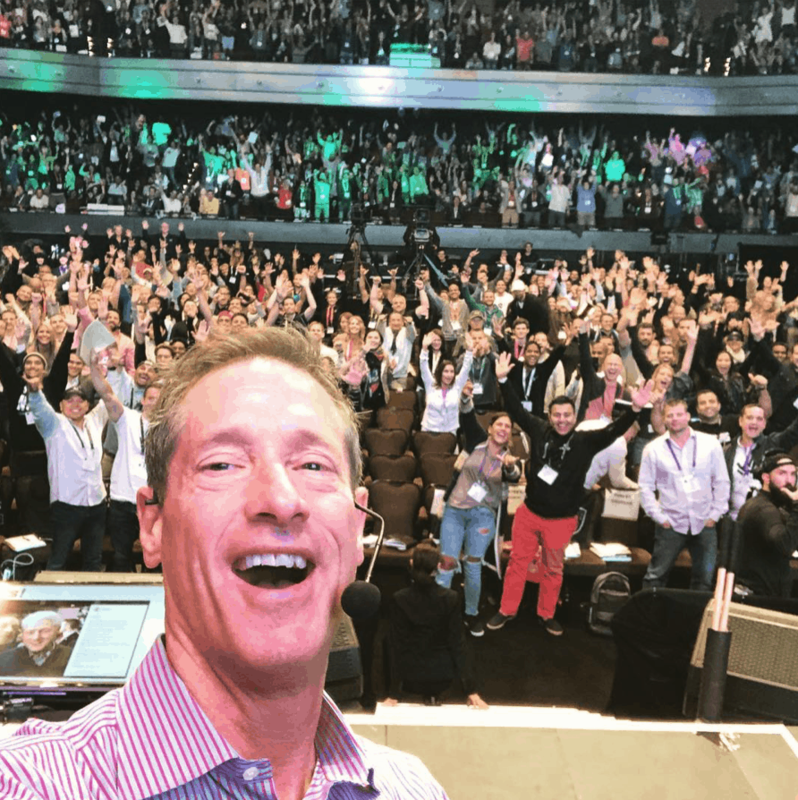 David Meerman Scott: I’ve been speaking at the Tony Robbins events now for about 5 years and I absolutely love it. They are fabulous events with a huge audience – very energetic – lights and sound and it’s absolutely wonderful. I love the stage. People think “why in the world are the Rolling Stones still doing concerts when they are in their 70s” and I totally get it. There is a wonderful think about being on the stage and it’s something I want to do when I’m in my 70s as well, 20 years from now. It is absolutely fascinating. NakedPRGirl: What are the top books on your book shelf? David Meerman Scott: I almost never read marketing and Public Relations books, I might skim them. I do read books by Seth Godin, he’s my hero, I love everything he’s written and always read them as soon as they come out. Mostly I’m reading things outside of marketing and Public Relations – I read about music, I read about the media, I read about arts, I read novels and I think what is really important is to focus on being very well versed in a wide variety of subjects rather than being really narrow. NakedPRGirl: Where would you like to be in ten years time? David Meerman Scott: I want to continue what I am doing – I want to be on the stage until I can't even be on a stage any more. I want to continue to serve others, I want to continue to make a difference in educating people – I don’t know what I will be educating people on in 30-40 year’s time but I want to continue to be doing so.